Our meeting planning team can plan every detail of a variety of corporate events and conventions, including shareholder’s meetings, seminars, client conferences, training sessions, product launches, sales rallies, gaming conventions, high-tech and user group conferences, company parties and celebrations, and much more. 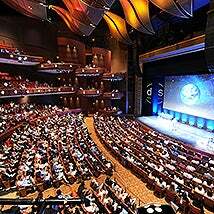 Ideal for sales meetings, corporate training, product demonstrations and more, Cobb Energy Performing Arts Centre’s Kessel D. Stelling Ballroom (link to Ballroom page) is versatile, visually pleasing and conducive to business. The event spaces are wired throughout with high-speed Internet access and state-of-the-art technology. Plan on a perfectly executed meeting, and count on Cobb Energy Performing Arts Centre to provide world-class facilities and a friendly, professional staff offering relentless attention to detail and a make-it-happen mindset.